Wash and soak rice for 10 to 15 mins. Slice the onions into juliennes. Slit the green chillies. Heat ghee and oil together in a cooker, add the cardamom, clove, bay leaf, cinnamon and cashew nuts and fry for a minute. Now add the onions and garlic till they become golden in color. Now add the vegetables and sauté and cook for 5 minutes till the veggies become tender and pliant. Now add the rice and sauté till it is fully mixed with the vegetables. Add salt and 4 cups water. Mix well and close with the lid. Cook for 2 whistles and serve hot with curd raita. 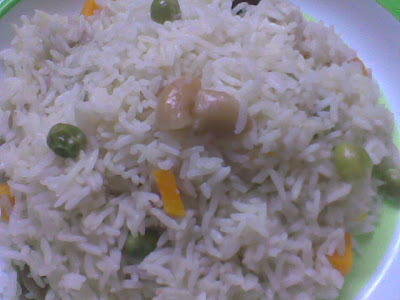 You can also roast the cashew separately and add it the rice before serving. You can also use basmati rice for a nice flavor and good taste. Nice and simple. Looks tasty. Lovely recipe..love your click..looks too delicious..
You’re gonna have a tiring time accepting my comments! 😀 I love this ghee rice concept!